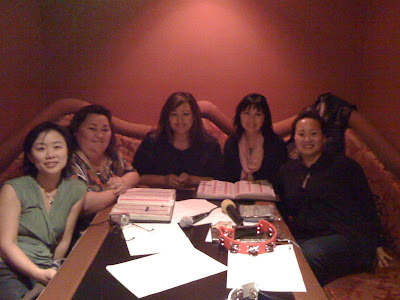 I had as much fun at this second Kimchee Mamas Meetup as I did the first one. Maybe even more, since I was more relaxed. Having met some of my dinner companions last time, there was less to be anxious about. I was not the first one there this time, but didn't think to introduce myself to the 2 gals sitting at the big empty table. I thought we might have a reservation, or a separate room, so I sat waiting for Glennia to show up instead. Silly me--Jodie and Sun were already there! Dinner was very good. Secret Garden was nicer inside than I remember from when I had dinner there 10 years ago. Though I must admit, the absence of mandu and borey cha (barley tea) was a little disappointing. So who all was there? Jodie, a newcomer to Kimchee Mamas, who may have a blog of her own soon if she finds the time. Glennia, who got us all organized. Her blog is The Silent I.
Stefania, who knows my friend Mir from BlogHer. Stefania's blog is found at www.citymama.com. Mary, our organizer from last time, who blogs at Chronicles of a BART Rider. The table was smaller this time, so we were able to share conversation a little more easily--everyone could hear everyone else. Very cozy. After dinner, we went to a nearby frozen yogurt bar: Honeyberry for dessert. I guess this is some kind of spinoff of Pinkberry, but I had never heard of either. Inside was a gelato station, followed by fruity soft-serve, and additional toppings. The cup you get to start with is intimidatingly large (soup bowl size! ), but I was assured that I did not actually have to fill up the entire bowl. You pay by the weight of your cup when you are done filling in. We ranged from $2 to $5 in our group. The toppings were interesting...very Asian style, with mini-mochi, bean sauce, and other sweets. I tried the mini-mochi, which was very good! I will try to be more adventurous next time. Of course, it would not be a Kimchee Mamas Meetup without the completely optional Noraebang Karaoke to end the evening. Here is a group shot (I'm behind the camera, heh). As before, Mary was our rock star--belting out a lot of lyrics to get high scores on the karaoke scale. I looked for Indigo Girls songs again, but no luck. I resorted to Billy Joel's My Life and Piano Man. I knew when I was tempted to start entering Phil Collins songs that it was time for me to go home before I really embarrassed myself! Stefania was our next singer, impressing us all with lyrics in Italian that she actually understood. Jodie and Glennia both sang as well. Jodie was a little more adventurous...or unlucky, ending up singing a couple of songs alone since the rest of us did not know them. Glennia (whom I am not forgetting this time!) was a great sport, jumping in with most of us when we needed a backup singer. We even got Sun to sing along by plugging in the Korean children's song, "San Toki", which translates to "Mountain Rabbit." Overall, this was less stressful than last time, which was my first trip ever to a noraebang. It was a fun evening, but I have to work this weekend getting ready to teach a new class, so I left early. We'll have to wait and see from the comments, or other blog postings, what these gals got up to after I left. So, when's our next Meet-Up? we orderd 3 bottles of soju and got piss drunk! just kidding.. heh. we sang a bit more and then went home. =) it was so good to see you again and i enjoyed all the great stories you shared! til next time! Looks like you had a great time! I'm so bummed I wasn't able to make my first meet (I was just back from the east cost). Thanks Mary, great to see you, too! Catherine, maybe we need to have an adoptee sub-group. Jodie is also adopted! I've tried some of the Bay Area Korean Adult Adoptee lists, but gave up attending their events. They were always too far to drive and not kid-focused. As always, Kimchi Mamas rocked the house! Great to see you again, and I look forward to next time.